This Monster has Stuff in the Store! Check It Out! In Russia, stories are told of Baba-Yaga (literally “Grandma Witch”), an old woman said to have power over night and day, and all plants and animals of the forests. Sometimes this name is used for a single being, and sometimes as a descriptor for a type of monster in the stories. 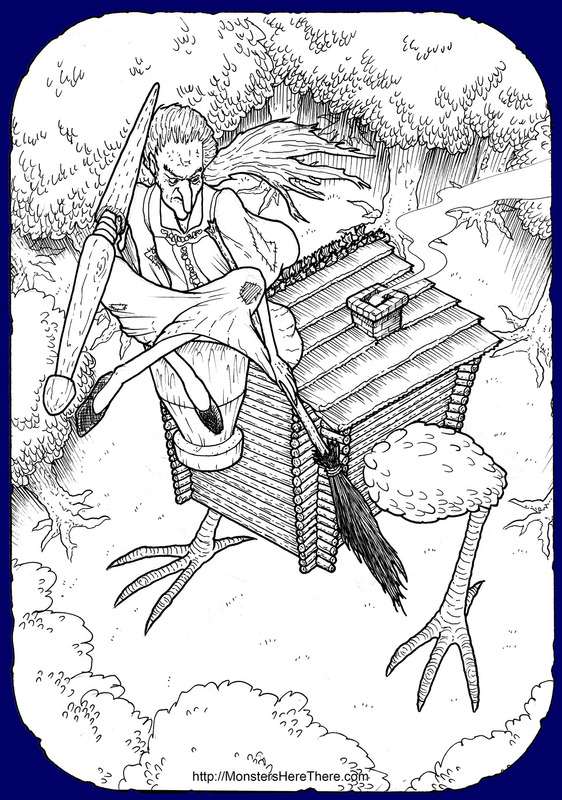 In all cases, Baba-Yaga is tall, skinny as a skeleton, and has a hunger for human flesh. her into the oven instead! In another tale, Baba-Yaga tricked a young man into tying three knots in a strand of her hair and blowing on it... which turned him into stone! When another young man showed up, his seeming inability to follow instructions tricked Baba-Yaga into tying the knots and blowing on them herself. Even as stone, she could speak; and so the young man got the cure for his friend by threatening to grind her up in her own mortar. Some tales have a group of Baba-Yagas living together (usually three sisters), while other tales tell of a single Baba-Yaga with multiple daughters, all very beautiful... and dangerous, for all of these relatives are also man-eating monsters. Typically, these extra villains are quickly dispatched by the heroes of the tales; but Baba-Yaga herself is not so easy to get rid of. In tale after tale, Baba-Yaga is the agitator. She wins in some stories, but loses in many more; and she often dies at the end of the tale, only to be fully restored again come the next tale. Perhaps this is because a hero’s greatness can only be seen in comparison to a villain’s wickedness; and there is no one more wicked in Russia than the man-eating terror, Baba-Yaga! The Complete Russian Folktale: Vol. 1 - An Introduction to the Russian Folktale, by Jack V. Haney, 2001 M.E. Sharpe, Inc., New York, NY, USA. ISBN: 1-56324-489-6 pg. 186-187. Folk Tales from the Russian, by Verra Xenophontovna Kalamatiano de Blumenthal, 1903/1979 Core Collection Books, Inc., Great Neck, New York, USA. ISBN: 0-8486-0216-1 pg. 23-25, 118-127, 153. Online: Click Here! Russian Folk-Tales, by William Ralston Shedden Ralston, 1880 R. Worthington, New York, New York, USA. pg. 148-151, 153, 155-156, 163. Online: Click Here!